Gum recession is an all too common problem for millions of people that if left untreated could lead to tooth and bone loss. But the good news is not only can the process be stopped, much of the damage can also be repaired through periodontal plastic surgery. 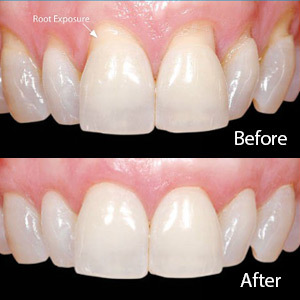 Gum recession occurs when the gum tissue protecting the teeth detaches and draws back to expose the root surface. This exposure may result in a range of effects, from minor tooth sensitivity to eventual tooth loss. There are a number of causes for gum recession, including overaggressive brushing or flossing, biting habits or badly fitting dentures or appliances. The most prominent cause, though, is periodontal (gum) disease, a bacterial infection triggered by plaque buildup on tooth surfaces due to poor oral hygiene. Fortunately, early gum disease is highly treatable by thoroughly cleaning tooth, root and gum surfaces of plaque and calculus (hardened plaque deposits), along with possible antibiotic therapy, to reduce the infection and promote tissue healing. Unfortunately, advanced cases of gum recession may have already resulted in extensive damage to the tissues themselves. While disease treatment can stimulate some re-growth, some cases may require reconstructive surgery to repair and further rebuild the tissues. There are several techniques periodontists (specialists in gums, bone and other dental support structures) or dentists with advanced training can perform to “re-model” recessed gum tissues. One of the major areas is placing tissue grafts (either from the patient or a human donor) at the site to encourage further tissue growth. Properly affixing a graft requires a great deal of training, skill and experience, especially in cases where the graft may need to be connected with adjoining tissues to establish a viable blood supply for the graft. In skilled hands, a periodontal surgical procedure is fairly predictable with minimal discomfort afterward. And the lasting effects are well-worth it — not only will your health benefit from restored gum tissue and greater protection for your teeth, you’ll also enjoy a more attractive smile.